Cloud is NOW everywhere. Not recently that it was possible to run a full WordPress blog or a CMS website directly from a Cloud based solution, as cloud were simply referred to as storage options only, say for example hosting only media and static files of your WordPress site, this limitation however have been lifted up far or more from many of the industry-leading cloud service providers. The good news is Cloud Computing now provides various resources to host your entire WordPress blog assets not only the static assets (like in CDN approach) – the WordPress blog entirely in the cloud – Google Cloud or the Amazon S3. Read our honest explanation of Cloud Computing if you’re haven’t already. This article will guide thru utilizing Google Cloud Platform and Amazon S3 storage to run WordPress blog or site. Do note that, deploying WordPress blog directly onto the Google Cloud or S3 is a little bit tricky unlike with Windows Azure, or other supported Cloud services. Any WordPress or dynamic Websites and many CMS can be seamlessly deployed and run directly from cloud storage of Google & Amazon S3 with OblakSoft’s Yapixx. Link or freshly install your existing WordPress blog with Microsoft Azure Cloud, read our comprehensive guide. Google Cloud, usually referred to as Google Cloud Storage is online file storage web service for storing and accessing user’s data on the infrastructure provided by Google – which is IaaS (Infrastructure as a Service) meaning you need to tweak it to deploy WordPress in this service. Google Cloud basically provides HTTP API, serves static data off the Cloud Storage and provides Google App Engine to build applications and deploy directly from it – so it’s kindda dependency over their system? Exactly not. We got to tweak and exploit the cloud limitations. It is a better idea to read Google Cloud Storage Overview before proceeding. OblakSoft has brought the ease to us, with their CloudSE. A good way to start is having Yapixx Appliance, and configuring it to run our way. Yapixx is a software solution that allows you to run WordPress on the cloud storage of Google and Amazon S3. Here is how to run WordPress blog on the Google Clouds using Yapixx appliance. Step 1. Download Yapixx virtual appliance OVA, approx 214MB, from OblakSoft downloads. Step 2. Open your VirtualBox (assuming you have already installed VirtualBox – an x86 virtualization software package from Sun Microsystems, if not you can download Oracle VM VirtualBox from here) and import the Appliance from file menu, Keyboard shortcut for Windows Ctrl+I. Step 3. 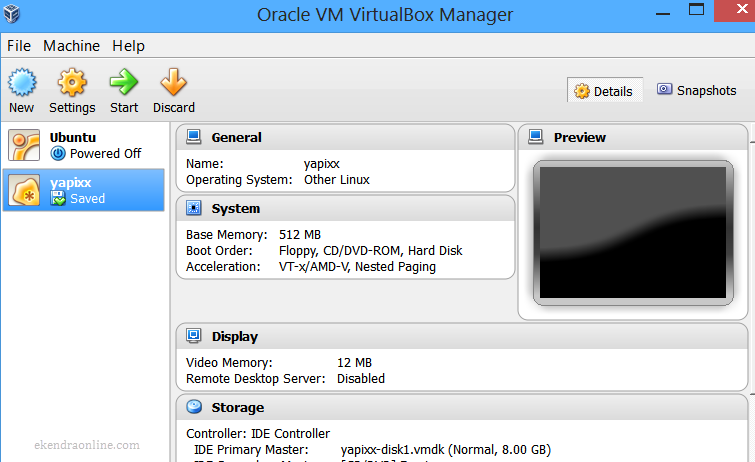 Run Yapixx from Oracle VM VirtualBox Manager interface. Interesting to note that Yapixx is termed as other Linux Operating System. Credentials to log into the Yapixx virtual machine are both yapixx and the root’s password is root. You might receive cautions from VM, like the one we received. USB 2.0 requires the Oracle VM VirtualBox Extension Pack to be installed. You can simply ignore the notification or proceed to download USB 2.0 Extension Pack from the VirtualBox download site. Step 4. Now, you should see the desktop of Yapixx virtual machine. Open browser and direct it to localhost. The local server is already running in this Yapixx VM. Step 5. On the instance of your local Yapixx virtual machine, you should be able to configure the connection to the Cloud Storage for Amazon S3 and Google Cloud. Provide necessary Access & Secret key along with the bucket URL. The connection is automatically checked for validity. You might be interested to view details and steps in this SlideShare presentation for installing WordPress on Amazon S3 and Google cloud from the developers. 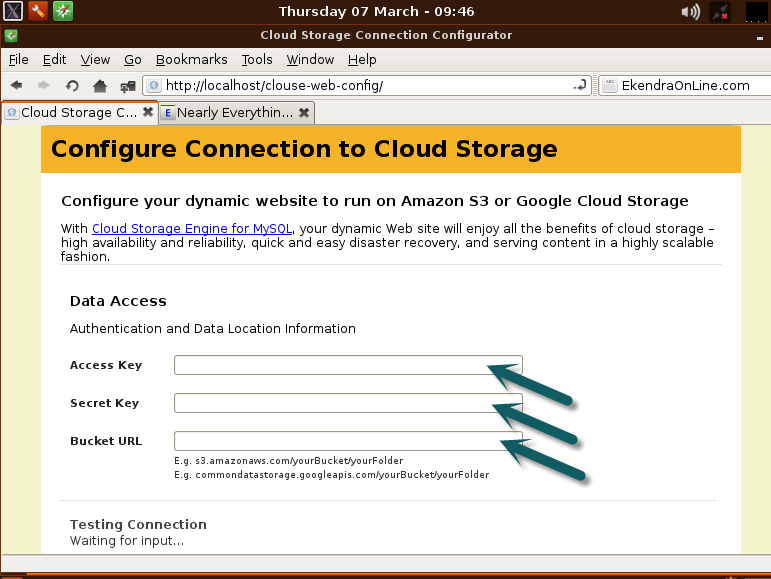 More on WordPress on S3: run a beautiful website on Amazon S3 Cloud Storage from OblakSoft.com.